Corbeau Fixed Rear Seat - Safari UNIVERSAL - Dezod Motorsports Inc - Home of the automotive performance enthusiast since 2002. 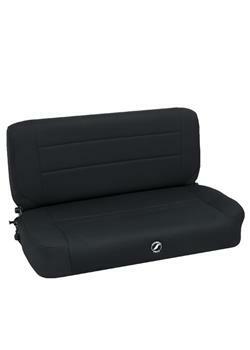 The Corbeau Safari seat is a fold and tumble rear seat and is the perfect compliment to your Moab front seats. Standard features include: powder coated tubular steel frame, heavily padded foam for ultimate comfort and a bottom covered in weatherproof carpet. The seat comes with floor mounts and rear lock-down brackets making installation simple. The Safari is available in Jeep color-matched vinyl/cloth and neoprene.